As a child, Sarah June avidly played piano & guitar. She began writing songs as a young teen. At 18 she dropped out of school to pursue music, playing live in Chicago & Detroit before settling in San Francisco. Sarah June’s music is largely inspired by the haunting images of urban wasteland of her youth in Detroit. She records her songs alone in her apartment, being careful to capture sincere & intimate recordings. Her signature sound is a uniquely fragile & childlike voice, vivid storytelling in her lyrics, & a classical/jazz inspired guitar style. 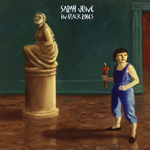 Sarah June’s sophomore album “In Black Robes” is a fitting reply to her first release - more distinctly personal & more intricate in musicianship. Her strangely fragile yet rich voice floats over guitar that is hypnotically simple, yet unexpectedly intricate. She effortlessly draws the listener in with visual & metaphor-rich songs focused on unique & timeless themes of death, love, & loss. Thirteen songs filled with ghosts & late-afternoon sunlight. Moments of past lives & dreams captured in music. 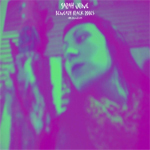 A collection of trip hop & shoegaze remixes of Sarah June songs. She has a pretty pixie voice, & she whispers & sings in tune, with a blend of seduction & childish naivete - tone-wise, not lyric-wise, as her lyrics are efficient & poetic. June accompanies herself simply at the acoustic guitar. Honest & enjoyable. Some of these melodies will etch their path in my brain after only two listens I’m sure. The music in itself it is rather simple in its making, an acoustic guitar and the female voice with rather minimal keyboard accompaniments that adds a dreamlike atmosphere, surreal and mysterious while the power of the music captivates the listener not by force but by some sort of strange seduction and gentle invitation. The work centres the compositions in the delicate flow of the voice, which is utterly feminine in sonority, like the kind of singing a fairy could do while in loneliness and melancholy. 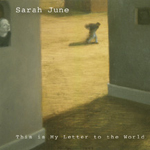 Sarah June’s debut album from our friends at Hand/Eye that originally brought her to our attention.